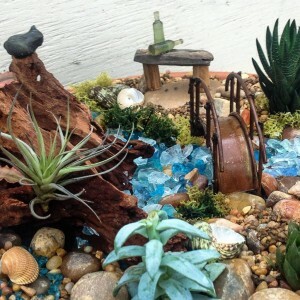 The miniature gardening trend continues, and we’re sure having fun with it. 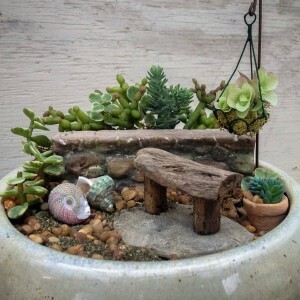 From tiny gardens in glass terrariums to a saucer planted with driftwood and a place to sit along the “water”, these little gardens spark the imagination of gardeners of all ages. Not swayed by her friend’s decided lack of enthusiasm, the first started looking through the miniature accessories, oohing and aahing at each tiny piece. As I listened to them, it became quite clear that the skeptical one (I was beginning to call her this in my head.) was being completely drawn into the fun of creating a tiny world with her friend. I walked up and started talking with them, asking if they had any questions about the miniature gardens. Unfortunately, I don’t have pictures of the garden she made with a lot of helpful suggestions from her friend, but I can tell you it turned out really well. A red Adirondack chair, the tiny tub with iced drinks, a beach along the water, some succulents planted in strategic places, and – Voila! 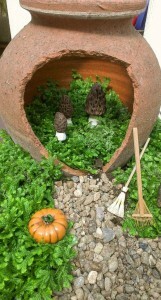 – a miniature garden completed. Soon new miniature garden accessories will be arriving, including tiny gourds and white pumpkins for fall gardens…and scarecrows too. 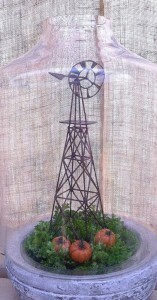 Meanwhile, the pictures here show some we’ve planted this summer using a windmill, tiny chickens (Everyone loves chickens! 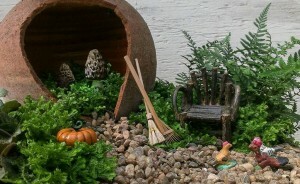 ), little wooden chairs, driftwood benches, morel mushrooms, and more. 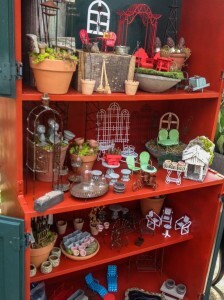 Maybe it’s time to let your inner child out…or create a miniature garden with your children. You just might get caught up in the magic like my friend, the skeptical one at the start of this post! As with any container garden, these are designed to last as a true garden. Be mindful of the amount of light your garden will receive when you choose your plants. There are many houseplants that work well together, including fittonia, Neanthe bella palms, and many ferns. Succulents work well in higher light and will need less water. Haworthias, aloes, crassulas and sedums are just a few of the many succulents you can use. Have fun! 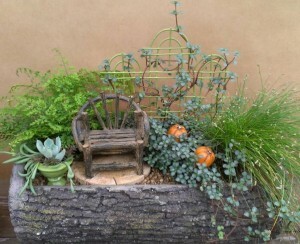 This entry was posted in Arrangements, Container, Fall, Indoor landscape, Miniature Gardens, Project and tagged fairy gardening, miniature garden accessories, miniature gardens, plants for miniature gardens, succulents in miniature gardens on September 2, 2014 by Kris Blevons.